"What H.G. Knows About Thraeshing"
This shocking cartoon appeared on the cover of Harper's Weekly (published July 3) less than a week before the Democratic National Convention began. 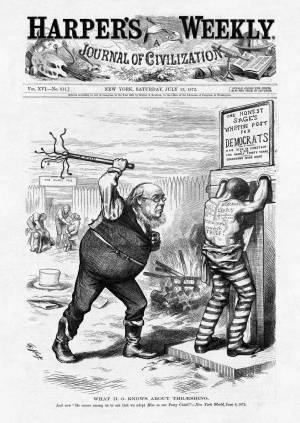 The ostensible meaning is the conflict between Horace Greeley's former harsh words of condemnation against the Democratic party (which appear on the shackled man's back) and his quest for their presidential nomination. The imagery, however, is clearly intended to convey an additional message: that Greeley has forsaken his former abolitionist role for that of the slave master. Like a slaveowner punishing his chattel, the candidate strikes the Tribune cat-o-nine-tails (lash) against the bare back of a Democrat, who wears a prison uniform. The man's cropped hair and the shading on his skin give the impression that he is black, while the prominent placement of "Blackleg" (i.e., swindler) on his shoulder may surreptitiously indicate his skin color.This interpretation is reinforced by the context of the entire scene: a whipping (foreground) and the branding of other Democrats from “The Slave Pen” (background), practices used against slaves in the American South. The irregular spelling of the verb in the title—“thraeshing”—is an amalgam of references to Greeley’s status as a gentleman farmer (i.e., threshing) and to whipping (i.e., thrashing) someone.